Today is our third anniversary. My husband and I enjoyed a beautiful trip to Vail, Colorado this past weekend. I will be sharing a review of the town and the resort we stayed at from the perspective of parents (traveling with children) in the coming weeks. But today I wanted to share a quick DIY project. I’ve had a few readers ask about the blue letter “B” from Bodhi’s first birthday party above and wanted to share how we got it. I’m also over on Chic & Cheap Nursery today sharing the details of Bodhi’s first birthday party. Bodhi’s letter “B” was just a cardboard version from Joann Fabrics for all of $2.99 spray-painted with Valspar’s aqua paint. If I were to do it again, I would use satin or flat paint. I just used the leftover paint from our spray painted mirror project. It’s super simple. 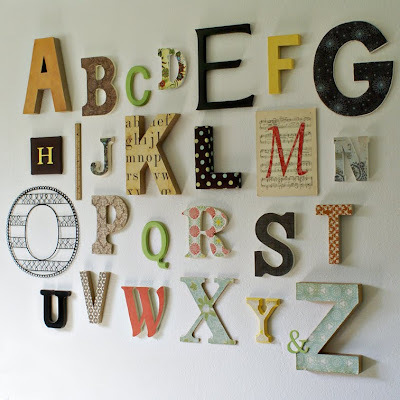 I’m considering doing an alphabet wall like this in our playroom soon just using spray painted letters in different colors and sizes just to save time. My house to-do list and dream projects/diy project list is a mile long, so I do need to take a few shortcuts. :) What are you working on these days?